I was at the supermarket yesterday and had to shake my head at all of the clever deceptive food labeling that’s everywhere. 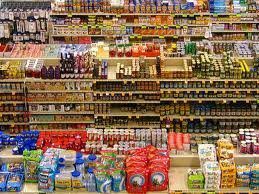 In every aisle, I saw tons of products claiming all sorts of things that are supposedly “healthy”, but are not in reality. This is food marketing deception at its worst. One of the things I noticed that really disturbed me was that I saw multiple examples of healthy foods in their natural state, while also noticing counterfeit overly processed versions of these original foods claiming that they were healthier than the natural version. However, in reality, all of these fake versions were actually MUCH worse for you than the original… and they still have the balls to claim that their overly processed “junkified” versions are better. The sad thing is that millions of people fall for this deceptive food marketing every day. Example #1: Product claiming to be “Better than peanut butter” This product is ridiculous! I can’t believe anyone would ever believe that this processed junk is better for them than natural minimally processed peanut butter. First of all, if you buy a good natural organic peanut butter, it is usually very simply only two ingredients… peanuts and salt. And they do not add much salt so it is not a high sodium product. However, this counterfeit peanut butter which claimed it was “better than peanut butter” (trying to seem healthier than natural peanut butter based on its label claims) had a list of processed junk in it you wouldn’t believe. First of all, they strip all of the natural healthy fats out of the peanuts so that it is a “low fat” product. Alright, now you have just taken away one of the healthiest parts of the peanut butter… the appetite satisfying healthy fats that you need to control cravings and manage more stable blood sugar levels in your body. To make things worse, the healthy fats were replaced with 2 different types of sugar-based syrups as well as additional dehydrated cane juice (aka SUGAR), in addition to added refined starches (in case you didn’t get enough blood-sugar spiking refined carbs yet). This product has taken something as simple and natural as peanut butter, and turned it into what should really be called some sort of processed junk candy. Yet, they claim that it is healthier for you than peanut butter. And somehow they get away with deceiving the masses like this on their label. Do not be their fool! Example #2: Product claiming to be “better than eggs”. I won’t get as detailed on this one because I recently went into good detail on this entire topic in another ezine issue. Basically, this product is just egg whites with a bunch of added chemical colorings, flavorings, and other nonsense, including artificially added vitamins. Again, this product has essentially ruined a good thing by removing the healthiest part… the YOLKS! And yes, the yolks ARE the healthiest part of the egg. Anybody that tells you different does not understand much about real nutrition. The important thing to look for in quality whole eggs are cage-free and organic. Most people don’t realize that almost all of the quality nutrition of an egg is found in the yolks. The majority of the vitamins, minerals, antioxidants, and trace nutrients are found in the yolks, not the whites. Even the protein in the whites isn’t as high quality in terms of bioavailability without the amino acid profile of the yolk that complements the amino acid profile of the whites. And no, the cholesterol in eggs is not bad for you… it actually raises your good cholesterol more than bad cholesterol improving your overall profile. And the fats in whole eggs are balanced and healthy for you as well. Bottom line… whole eggs are healthier than egg whites. It’s not even a close comparison. The label claims are just another example of food marketing deception. Example #3: A product claiming to be “better than butter”. This was essentially crappy margarine which is loaded with highly processed and deadly trans fats, yet it had the nerve to claim it was “better than butter”. Don’t fall for it! Even low quality butter is better for you than any margarine on the market. One problem with butter are the pesticides and hormones frequently found within from improperly raised cows. For this reason, it’s always a good choice to go with organic butter, and if you can find grass-fed butter, then I would even say it can be healthy for you. Grass-fed butter is higher in the natural form of beneficial conjugated linoleic acid (CLA). In fact, adding a little butter to your steamed vegetables helps your body to absorb more of the vitamins and minerals in the veggies. Also, due to the content of stable saturated fats in butter, this makes butter one of the best oils to cook with. Oils that are high in polyunsaturated fats such as soy, corn, safflower (and even flax) are the worst to cook with due to the highly unstable nature of their chemistry. I have a fully comprehensive article on which oils are healthiest for cooking and which are not based on their chemistry. Another point… the saturated fat in butter is NOT bad for you. We’ve already beaten a dead horse with that topic in previous articles, but again, more detailed articles about that topic are found at my site. You can find dozens more articles about all of these controversial health and fitness topics at my website and facebook fanpage below. To your good health! For a free fat loss recommendation detailing why you struggle with stubborn belly fat, complete free online assessment.